Here at Awwwards we are dedicated to our mission to improve performance and champion best practice in mobile apps based on web technology. It was a natural step for us to join forces with Google to develop a system to evaluate the quality of mobile projects and so The Mobile Excellence Award was created. The badge offers a seal of recognition, a guarantee of best practice, which has been stringently evaluated by mobile experts. We don't want there to be any mystery, this award can be obtained by anyone who submits their site to Awwwards, our objective is to help raise standards across the board so we have created a printable checklist that summarizes the essential points that must be optimised to reach the standards necessary for a Mobile Excellence Award. 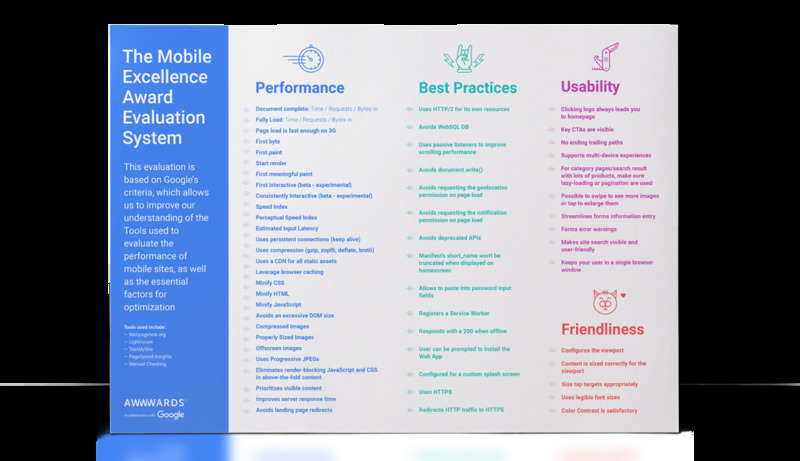 The file can be downloaded as a vectoral PDF which you can print to the size that you wish, Mobile Excellence Guidelines Checklist PDF. If you're proud of your latest mobile site and want it to get the recognition it deserves from industry experts, make your submission here!